Schottel has been selected to fit eight newly-built ferries with the new Schottel Rudder EcoPeller (SRE, EcoPeller) for two of Norway’s leading ferry lines. In close cooperation with the customers and Multi Maritime, the Norwegian ship designer in charge of the projects, the EcoPeller was chosen for three Fjord1 ferries with 2xSRE 340 CP each and five Torghatten ferries with 5x2 SRE 560 CP. “Our new ferry designs are the result of continuous efficiency optimization. Every potential efficiency increase and every optimization of the energy consumption in terms of design, components and equipment has been exploited. The EcoPeller was chosen because we expect that it fully supports our targets,” said Gjermund Johannessen, CEO at Multi Maritime. “The EcoPeller is a drive with outstanding hydrodynamic, mechanical and electrical efficiency ratings. With these properties, it helps to meet the requirements of the Norwegian zero/low emissions policy,” declared Schottel chief executive, Christian Strahberger. Extensive investment in research and development and optimized process sequences were crucial factors in the fully new development of the EcoPeller on its path to success. A major key to this success has been the patented HTG high-torque gearbox, enabling a new pod geometry. Furthermore, the EcoPeller has the most efficient pull propeller in its class and an enlarged lateral area offering very good course stability. Variable stem lengths and installation components allow optimal integration into the vessel design. The ferry company Fjord1 will operate the Brekstad-Valset route in 2019. The EcoPeller’s most advanced technology enabled Schottel with customer Havyard Ship Technology, Norway, to be selected by Fjord1 again. The new ferries of the MM62FD EL design have a length of 66.4 m, a width of 14.2 m and a transport capacity of 199 persons and 50 vehicles. The main propulsion is provided by batteries that are recharged via a special docking device; additional diesel engines ensure mobility. The input power of the SRE 340 CP is 900 kW. All three vessels are due to be delivered in 2018. Two of them will operate the Brekstad-Valset route, the third will operate the Husavik-Sandvikvåg route. 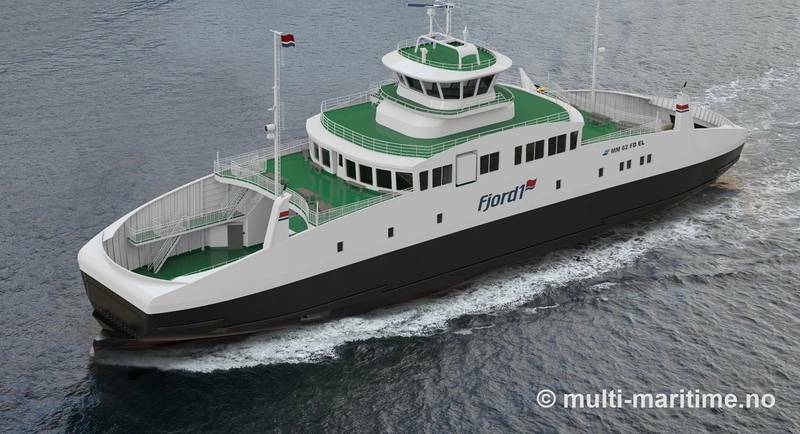 Multi Maritime designed MM125FD LNG ferries for its customer Torghatten Nord. In addition to energy efficiency and low-emission technologies, the course stability and manoeuvrability characteristics were custom-tailored to the busy Halhjem-Sandvikvåg route and thus a deciding factor. With a length of 134 m and width of 20.7 m, the ferries accommodate up to 549 people and 180 cars. In total, five new vessels are being built simultaneously by two shipyards for delivery by 2018. Schottel's customer for two vessels is Vard Brevik, which will be building in Braila (Romania) and Brevik (Norway). Schottel is supplying six further EcoPellers to Yalova (Turkey) for the customer Tersan Shipyard. The ferries have an LNG/electric hybrid propulsion system, with the additional batteries to be charged as a “plug-in” from the mainland. The input power of the Schottel SRE 560 CP is 2,700 kW. The transport volume on the 130 Norwegian ferry routes totals 20 million vehicles. These routes are currently serviced by approximately 200 ferries, which are to be replaced gradually by environmentally-friendly, emissions-neutral or low-emission ferries, or converted where technologically possible. Priority is expressly given to battery-powered propulsion systems. With the high-performance EcoPeller, Schottel perfectly fills this market niche. 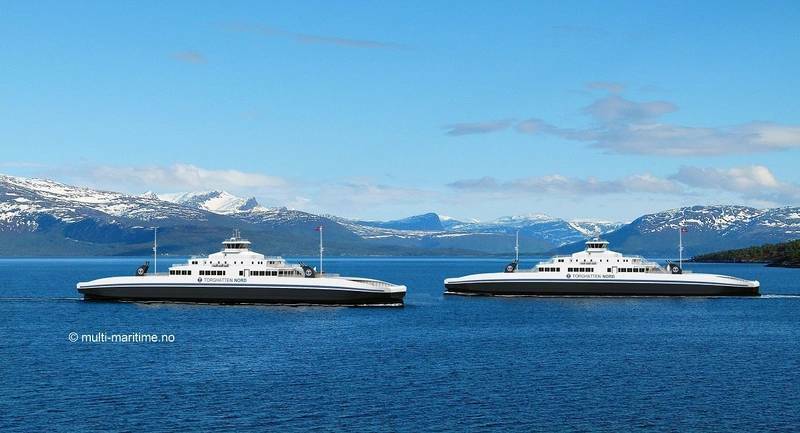 Norway’s Ministry of Transport envisages the construction of more than 50 new vessels by 2021.